The Bar Magic Event Returns! Following the success of the extra Bar Magic Night at last year's International Magic Convention in London, the organisers plan to repeat the event this year, on Saturday November 15th. Those who attended last year will know how great it was to be able to see close-up magic performed in a natural setting, a beautiful and intimate wine bar just around the corner from the Bridewell Theatre. Artists performed different length sets over the course of the hour and the audience had the chance to wander from one performer to another. "In terms of bar magicians this year we have managed a real coup in being able to book two performers who really shaped how Bar Magic is seen in the US today; Doc Eason and Bob Sheets (photo)" says Noel Britten, the talent coordinator for the Convention, "Those who know their magic history will know that it was Bob who started the legendary Tower Magic bar in Aspen, Colorado. Doc saw him perform there, was mentored by him and then took over as the resident magician when Bob left. With almost thirty years of performances at the Tower Bar for Doc, and international performances and the tutelage of legendary bar magician Heba Haba Al with Bob, this promises to be an exhilarating and fun packed night that you can happily bring friends and family to, to see these two world class performers in their natural environment. They will be joined by other top performers still to be announced. As part of the ticket price you will also get to see Tom Mullica's one man Tribute To Red Skelton show on the same evening. As one of the world's most famous bar magicians while he ran his Tom-Foolery Bar, Tom always cited Red Skelton, a legendary American comedian, as one of his major influences, and in this special show Tom recreates some of Red's most famous and funniest routines. It promises to be an exceptional and unforgettable night of laughter and magic." Ever wanted to join The Magic Circle but were not sure if you were quite up to the exam? Well, The Magic Circle has introduced an Apprentice Scheme in order to allow those wishing to join, the opportunity to enjoy most of the benefits of membership whilst they prepare for their exam. You can visit the famous Magic Circle building, meet top magicians, watch lectures, see shows, receive 'The Magic Circular' magazine, study the museum artifacts and research in the extensive library. You may even get the opportunity to perform there yourself. Once you pass your exam, you will then be entitled to call yourself a Member of The Magic Circle (MMC) and have use of The Magic Circle logo in your publicity. 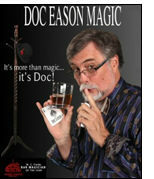 Doc Eason: Illusions Magic Bar One-day Masterclass, 16th or 17th April. Doc Eason has been a featured entertainer in Snowmass, Colorado for over 34 years. Last year he was awarded Close-up Magician of the Year -for the second year in a row- and Lecturer of the Year from the Academy of Magical Arts. He was the first magician ever named 'WC Fields Bar Magician of the Year' in 2004. His legendary 27 year run at John Denver's World Famous Tower Comedy Magic Bar speaks for itself. His enjoyable and informative lecture is about much more than Bar Magic. 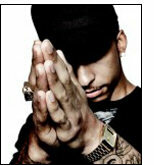 It is loaded with tips, lines, bits of business as well as audience tested material from his working repertoire. This acclaimed talk is designed so that everyone, from the absolute novice to the seasoned pro, will walk away with something useful. Steve Hewlett is... thinking inside the box. Britain's Got Talent finalist Steve Hewlett, embarks on his first major UK tour in 'Steve Hewlett is... thinking inside the box' together with his hilarious friends. From talking hands, to bottles of water, from Arthur Lager to little 'Simon Cowell', Steve and his creations won the hearts of the nation and wowed the judges in the BGT final. With special guest multi-award winning magician Richard Griffin. 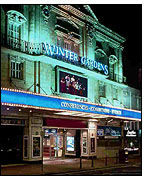 The tour kicks off tonight at the Congress Theatre in Eastbourne. Matthew Wright Lecture Tour - on now! Steve Gore writes: Matthew Wright, two-time FISM award winner and Magic Circle Close-up Magician of the Year, is back in the UK in February/March for a brand new lecture tour packed full of magic, philosophy and humour. Anyone who has seen Matthew lecture knows that the passion he has for performing and practising is transferred into his teaching effortlessly. He will leave your club members with not only some new skills and tricks, but also with the inspiration to go away and practice what they already have. Matthew has been the Director of Magic at The House of Illusion in Spain for five years and during that time he has helped many magicians turn their promise and ideas into fully routined professional performance pieces. He uses this experience to teach you and your members how to develop and create your own original pieces, with simple formulas and lessons on character building, routining and rehearsals. This is not a boring “theory only” lecture though. Everyone from the 'new to magic' to the 'seasoned professional' will find something to excite and inspire them, including brand new effects never lectured before.